Librarians and word-lovers, listen up! 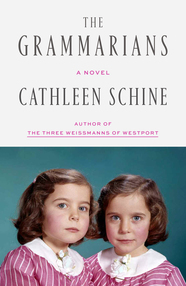 Cathleen Schine’s novel THE GRAMMARIANS is an enchanting, comic love letter to sibling rivalry and the English language, and should find kindred souls on shelves everywhere. The author herself loves libraries and stopped by to share a message with all you word warriors out there. I was visiting my 90-year-old mother in New York City recently, and while we were taking our usual slow walk down the block, stopping to pet every cava-poo, labradoodle, afghan, dachshund and rescue mix East 96th Street had to offer, my mother stopped me in front of an older building , her favorite building, the Carnegie branch public library. Just to admire its existence. She goes to a book club there when her health allows, and it is one of the things that keeps her going, I think. So first and foremost I want to take this opportunity to thank you all–you make my mother, and lots of people like her, happy!